In textile industry, the fibers which are obtained from plants, minerals or animals are known as natural fiber. Different types of natural fibers are hemp, wool etc. The fibers, whose chemical composition, structures and properties are significantly modified during the manufacturing process in textile industry, are termed as man-made fiber. Different types of man-made fibers are Nylon, polyester etc. The emergence of Nylon established a miraculous fiber strength which could not even be imagined for the natural fibers. All kinds synthetic fibers, produced in succession to it, also had almost the same level of strength and this is the strongest point of the man-made fibers. However, in contrast to this, the objects of regenerated fiber series (fof example, rayon) are quite inferior to natural fibers. The peculiar forms, created naturally in the growing procedure of fiber such as the hollow and natural strands of cotton fiber, crimps of sheep wool, scales, felt characteristics etc., cannot be created in man-made fibers even after using latest scientific technology. This mysterious excellence is the strong point of natural fibers. There is a special charm in natural fiber which has kept it in great demand in the recent years. For clothes, it is in demand due to its merits from the point of touch such as being warm, having a good feel and being comfortable. Apart from the quality, if one sees from the economic point, balance of demand and supply is governed by the condition of climate and farmland in case of natural fiber. But, in case of man-made fiber, human operation is easy. Moreover, the fibers of regeneration series can have a self-sufficient supply of domestically produced raw materials to a certain extent and so their prices can be relatively cheap. In case of natural fiber, it cost more to produce and buy. Textiles made from natural fibres tend to be more expensive than man-made fibers. 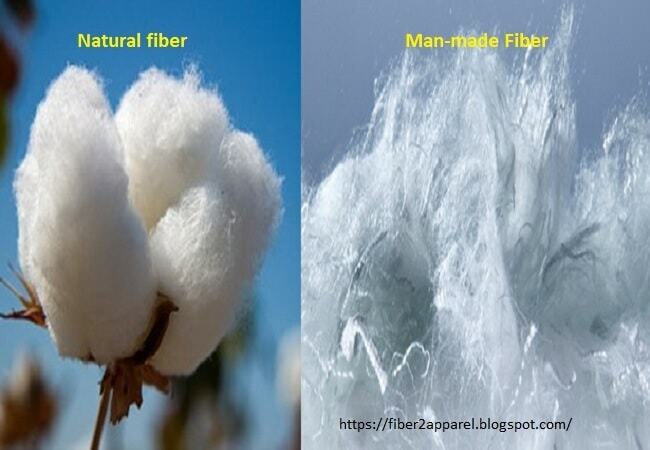 Natural fibres are very soft and absorbent than man-made fibers. Cotton is more comfortable next to the skin due to their high absorbency and softness. Experience higher levels of wear and tear. Since, their natural state is not compromised during production. It means that natural fibres they have lesser endurance and strength than synthetic fibres. Higher endurance to heat in case of natural fibers. Whereas synthetic fibres will melt when exposed to fire, natural fibres will endure high heat. Man-made fibers are highly elastic and easy to blend with other fibres. Fabrics such as spandex are very elastic and are often blended with other natural fibres such as cotton to make exercise wear and other stretchy cotton apparel. In case of man-made fibers, their production is not eco-friendly. The chemical processes involved in producing synthetic fibres results in environmental pollution than natural fibers.